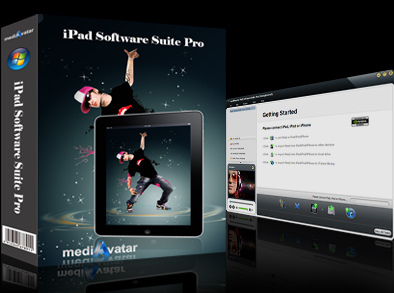 mediAvatar iPad Software Suite Pro provides you with the perfect solution to transfer movies, music, photos and PDF/EPUB books among iPad, PC and iTunes, download, convert and transfer online videos to iPad, convert CDs/DVDs/videos/audios to iPad media files then transfer them to iPad, as well as share media files among multiple iPad, iPhone, iPod devices. 6. Make any videos or music into iPhone ringtones and transfer them to iPhone directly. 9. Search iPad media files quickly, customize track info and rate iPad media files, preview iPad movies and take snapshot, and many other features available for you to explore.